NEW YORK (REUTERS) - Oil prices sank to their lowest levels in over a year Tuesday (Dec 18), tumbling more than 5 per cent in heavy trade due to fears of oversupply and deteriorating demand, extending a selloff that has taken major crude benchmarks down more than 30 percent from an October peak. 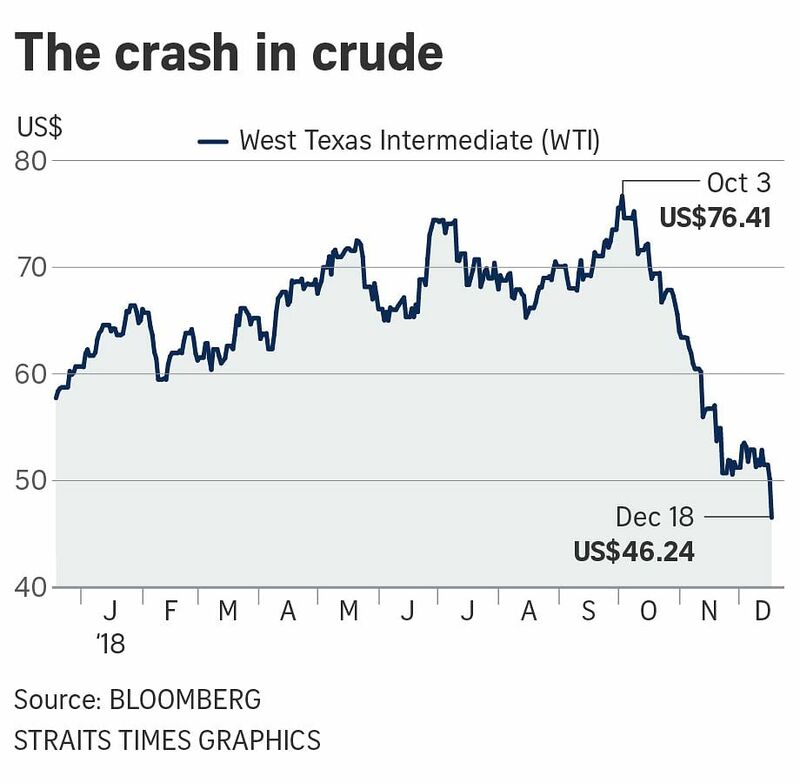 US benchmark West Texas Intermediate (WTI) slid US$3.64, or 7.3 per cent, to settle at US$46.24 a barrel, the weakest since August 2017, and almost 40 per cent off the roughly four-year highs reached at the start of Ocober. In post-close trade, the contract was down 8 per cent to US$45.91 a barrel. Global benchmark Brent lost US$3.35, or 5.62 per cent, to settle at US$56.26 a barrel. During the session, Brent hit a 14-month low of US$56.16. US crude and global benchmark Brent both extended declines in post-settlement trade after trade group The American Petroleum Institute said US inventories unexpectedly climbed in the latest week. US crude stocks rose by 3.5 million barrels in the week to Dec 14 to 441.3 million, API said, compared with analysts' expectations for a decrease of 2.4 million barrels. If that build is confirmed by US government data Wednesday, it will be the first increase in three weeks. Investor confidence is deteriorating, with more fund managers expecting global growth to weaken over the next 12 months, the worst outlook in a decade, Bank of America Merrill Lynch's December investor survey showed. "There was a flood of supply-side news yesterday which, in combination with the demand destruction that the stock market slide implied, got us below US$50 (a barrel for US crude), and that gave us a strong sell signal," said Bob Yawger, director of futures with Mizuho in New York. World stock markets inched higher as investors focused on the next move for the US Federal Reserve, which kicked off a two-day monetary policy meeting on Tuesday. Equity markets have had steep declines over the last two months, with several stock sectors having reached bear-market territory. Among the bearish factors, Britain's largest oilfield restarted production, increasing supply, the US government said output from shale would top 8 million barrels per day (bpd) this year and data suggested US crude inventories would rise this week. The Organization of the Petroleum Exporting Countries and other oil producers agreed this month to curb production by 1.2 million bpd, equivalent to more than 1 per cent of global demand, in an attempt to drain tanks and boost prices. Oil production from seven major US shale basins is expected by year-end to surpass 8 million bpd for the first time, the US Energy Information Administration said. Britain's largest oilfield, Buzzard, restarted after repairs on pipe work, a spokesman for operator Nexen said on Monday. Buzzard produces about 150,000 bpd and is the largest contributor to the Forties pipeline that brings oil to shore from more than 50 fields. Separately, Libya's state oil firm declared force majeure on operations at the country's largest oilfield, El Sharara. The 315,000 bpd field, located in the southern part of the country, was taken over on Dec 8 by groups of tribesmen, armed protesters and state guards demanding salary payments and development funds.